Feeling Unintelligent or not Smart Enough? Read this! I'm struggling to find a suitable, yet catchy title for this post. So I thought to myself, why not write out the post first and then title it later. I'm doing just that. This could sort of be a follow-up from my previous post about low self-esteem, read it here. Anyway, I talked about different areas of our lives that could cause low-self esteem, one of them being not feeling smart/intelligent enough and that has got me thinking a lot. Let's take a look at this analogy below. 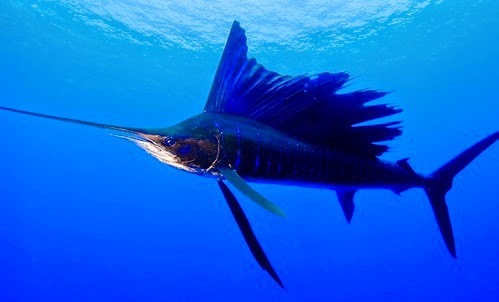 The fastest fish is said to be Sailfish and it has supposedly recorded swimming speeds of nearly 112 KM/H (70 MPH). Now, that's fast isn't it? But let's take that Sailfish out of the ocean and bring it to land. How do you think it will fare? Very badly of course. You know why, because it isn't made for that environment. It hasn't being designed or created to live or function on land. It's natural habitat is in the ocean. Following that analogy, could it be that the reason why you're struggling intellectually or academically is that you're not functioning where you ought to be? Could it be that you are not in your natural habitat? Hence, every time, you find ourselves putting in so much effort, time, money e.t.c. and yet nothing really good comes out of it. If you're a student and you find yourself struggling with your course, maybe you were not really designed to be a Lawyer, maybe you are supposed to be a Doctor. For those that have jobs that they struggle at, have you ever thought that it's because it's not what you're designed for? Or maybe it's not God's perfect will for you to be there? Think about that and don't just settle to thinking and feeling that you're not good enough. You are! But let's even assume that the reason why you're struggling is because you're outside God's perfect will. Does that mean that the situation is not rectifiable? Certainly not. Romans 8:28 says "And we know that all things work together for good to them that love God, to them who are the called according to his purpose". As long as you are now ready to align yourself to His purpose, He can and He will work everything out for your good. The past, present and future. I guess what I'm trying to say is that we need to seek God in the struggles and the challenges. We need to know why we are going through it and if it's in His will. We need to seek Him to know the way forward. Don't just take a decision to change your course or quit your job based on your feelings. Seek God! But in all of these, remember that you are good enough and you can do ALL things through Christ that strengthens you. Go with that mindset. Very true sis! I keep saying, the greatest frustration of man is functioning in the wrong place. If only people knew their place.. I totally love the fish analogy! God bless you! Bubba, as i concluded reading this yeah, a thought hit my 23 years 3 months and 1 day young and confused head, and it went "A purposeless life is not worth living". I love love and Love what you said about us not being very ghen-ghen probably cause we are operating outside of our habitat and to that I concur fully. Permiot me to add that top of why i believe I and many do less of what we are capable of doing and go through life being less of what we can be is cause we have failed to identify a purpose, a cause, a Mission on Earth, a WHY.. and I am learning that until a man is able to do so, I fear that me and many will keep floating in the confusion that is called life and live to be second best all the time.. Like think about it, just like the fish you described above, would Steve Jobs (R.I.P) have made a good Doctor?! i guess not! but when he found out his purpose, regardless of the fact that he had little formal training, he excelled beyond imagination, and hence created the phone coy you are probably holding... So Bubba... Find your Why, and it will create your life... Cheers Tomi... I love the fact that you are back full time **Wears mr. Nigeria smile... the **Shines teeth... Dont go nowhere again oh jo o! Mo'n be yin oh! Thank you for reading Duru. This is spot on "...doing and go through life being less of what we can be is cause we have failed to identify a purpose, a cause, a Mission on Earth, a WHY..."
Lol @ the crowd goes 'yeaahh mehn'. I'm so sorry Duru. I really am. The thing is I want to change my blog design completely and give it completely new look. I also want to start doing more videos. I just haven't really gotten round to doing it. In the mean time, I might start doing more of videos on YouTube. I'll keep you posted. Thanks a lot for checking up on me. **In the voice of teh great IMSU Choir... We misss you!!!! We misss you oh!!!!!! Chei! :( Please come back.. Please come back ooooohhh!! Chei!